At the core of the old adage “It takes a village to raise a child” is the idea that parents alone cannot possibly provide all of the resources necessary to ensure the healthy development of a child. Another aspect of this saying, that receives less attention, is the village aspect. Villages are mostly small. Thus, youth need support from those closest in proximity to them. Homework for many middle schoolers can be a daunting task. CASE Volunteers Jesse Grooms and Chelsea Waldron, students from the Institute for G.O.D., are there to help. And so, as voluntary residents of the ‘villages’ of Metro Nashville, we all have to determine what role we play in the healthy development of youth in our proximity. What are we as individuals contributing towards the development of youth? The Search Institute, whose goal is to “bridge research and practice to help young people be and become their best selves,” has developed a list of developmental assets that are important to the healthy development of youth (1). The list is 40 items long and lays out all the supports, opportunities and relationships young people need across all aspects of their lives. The list hinges heavily on the presence of adults that truly care taking the time to invest into the next generation. Part of the motivation behind our CASE after-school program is to ensure we contribute to the well-being of youth in our “village.” We know parents can’t do it alone. Many of our staff are parents ourselves, and we know the same to be true for us! Regarding middle school students in our program, many have faced a variety of adverse experiences. As an after-school program we acknowledge our limits in assisting these youth. But this is something everyone must do. We acknowledge what gifts and skills the LORD has given us to contribute to the well-being of youth and we contribute our small, or maybe big, part. After all, isn’t it healthy for ALL adults to play some kind of hands-on role in the development of youth? Obviously, not everyone can be a teacher or a social worker or is a parent, but all adults can teach a skill, play a game, coach a team or contribute in some other way towards building confidence and dignity in a child. 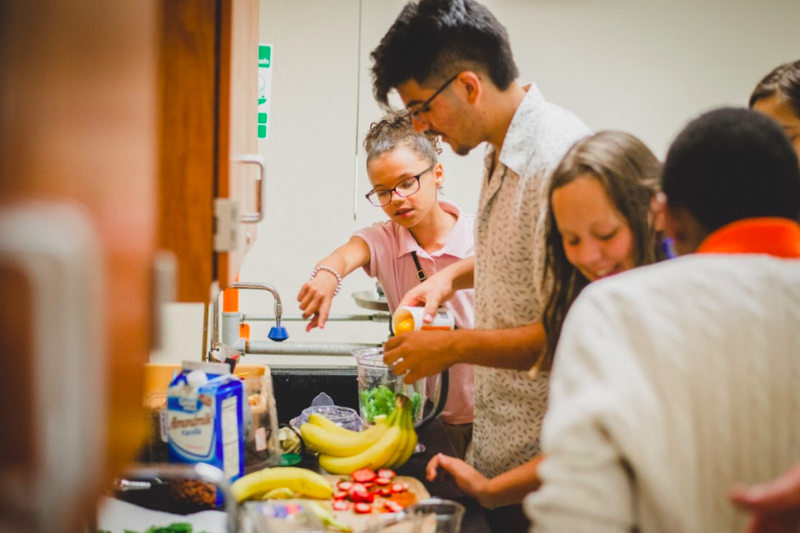 Max Alvarez has volunteered with CASE for the past 2 years where he has provided the youth with skills in nutrition and cooking. This is a student favorite! With CASE, we do our best to be an asset to youth based on the situations they find themselves in. While we have planned programming, each day is subject to what has happened in the kids’ lives since we last saw them. Did something happen in their neighborhood that affected them? Did they get bullied at school? Did they get in an argument with a friend? Did they get bad grades on their progress report? Or maybe it’s the opposite. Maybe they had a fun block party in their neighborhood. Maybe they met a new friend. Maybe they improved their grades. As program managers, we have to respond to the needs of our youth and be assets to their development. But, it happens in real time. And because our program is for middle school students, we recognize that built into their neurological development is a time when they are testing limits. Certainly, this makes for some frustrating and unpredictable days. But in the midst of that, what these youth need are non-stressed, emotionally attuned, mentally present adults. Adults who can teach the significance of certain boundaries, adults who can reinforce a child’s worth and promote their self-esteem, adults who can expose youth to a variety of activities that spark inspiration in them and put them on a path towards purpose. So, if you are reading this, recognize what role you play in the development of youth, all of whom are vulnerable and need the guidance of mature adults. It’s good for us and it’s good for youth to be surrounded by people who care about them helping them to mature into healthy, productive members of the village in which they live. (1) "The Developmental Assets Framework." Search Institute. Accessed March 16, 2019. https://www.search-institute.org/our-research/development-assets/developmental-assets-framework/. The C.A.S.E. programs at Dupont Hadley Middle Prep, Donelson Middle, and DuPont Tyler are programs of the Nashville After Zone Alliance. The Nashville After Zone Alliance is a network of coordinated after school programming for Metro’s middle-school students. NAZA is a partnership among the Nashville Public Library, MNPS, and other existing youth-serving groups. It is modeled on successful efforts in other cities and is organized around geographically-defined zones.